In his effort to forge a united front of Arab Gulf states against Iran’s increasing hegemony, U.S. President Donald Trump has called on Saudi Arabia to end its dispute with Qatar. In what was described as a “foreceful” telephone call earlier this month with Saudi King Salman, Trump demanded that the kingdom and its Arab partners quickly end a nearly year-old rift with Qatar that has left U.S. allies in the region fractured, Reuters reported, citing two U.S. officials who were briefed on the conversation. 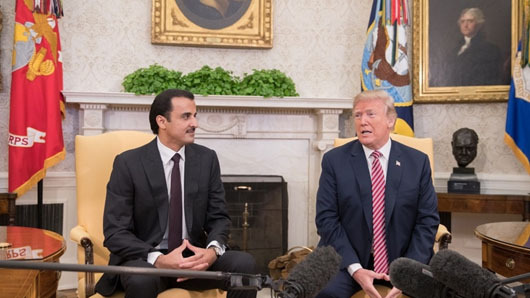 U.S. President Donald meets with Qatari Emir Sheikh Tamim bin Hamid al-Thani at the White House on April 11. A second official knowledgeable about the call said Trump insisted the dispute be resolved within three weeks, in part because of a looming decision on Iran. Trump has set a May 12 deadline for European powers to commit to improving the 2015 nuclear agreement with Iran or he will pull the U.S. out of the deal. “The president’s focus has always been on Iran, and its nuclear and missile programs that threaten all the Gulf states, as well as Israel, and he stressed that the feud the Saudis and Emirates are having with Qatar makes no sense,” one of the officials told Reuters on condition of anonymity. Saudi Arabia, the UAE, Bahrain and Egypt severed travel and trade ties with Qatar last June, accusing it of backing Iran and supporting terrorism. Qatar denies the accusations. An effort to improve U.S.-Qatar working relationship was on display this week as Qatari Minister of Economy and Commerce Sheikh Ahmed bin Jassim bin Mohamed al-Thani attended economic forums with representatives from the U.S. Chamber of Commerce and other groups in Charleston, South Carolina and Raleigh, North Carolina. Sheikh Ahmed noted that Qatar has been increasing its investments in the U.S. and partners with numerous American companies such as Boeing, ExxonMobil, ConocoPhillips and Raytheon. The minister said Qatar Airways alone provided a $92 billion boost to the U.S. economy through the purchase of as many as 332 American aircraft – a deal that supports more than 527,000 jobs. He said $146 billion worth of exports and orders to Qatar have generated one million American jobs that depend on doing business with Qatar. Sheikh Ahmed said 15,000 American citizens live in Qatar, where 5,000 highly skilled individuals are currently working in the private sector. Qatar was also “the first Arab Gulf state to develop relations with Israel, for which it was roundly condemned by its fellow Gulf Cooperation Council members,” Simon Henderson, an analyst with the Washington Institute for Near East Policy, noted in an April 8 op-ed for The Hill. Henderson also addressed the ongoing dispute between Arab states and Qatar, noting that the Saudis had invited Qatar to attend the Arab League summit meeting in Riyadh on April 15. “Bahrain, which has spoken of reviving a claim to part of the Qatari mainland,” remains hardline. Its foreign minister said on April 3: ‘There is no way of reconciliation.’ But Egypt appears distracted by its domestic concerns and has yet to force out the several thousand young Qataris studying there,” Henderson wrote.